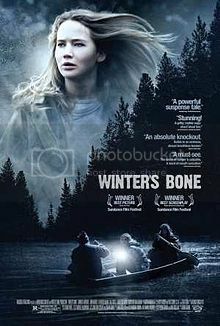 “I ain’t going nowhere.” A critically acclaimed independent drama that deserves a wider audience, Winter’s Bone was directed by Debra Granik (Down to the Bone) and stars Jennifer Lawrence as “Ree Dolly,” an impoverished teenager living in a dirt-poor rural area of the Missouri Ozarks with her mentally ill mother, brother Sonny and sister Ashlee. Desperate meth addicts populate the ravaged landscape like zombie refugees from Night of the Living Dead. Ree embarks on a harrowing journey to track down her father Jessup, a meth cook out on bail, before the rest of the family gets evicted from their home. As you might expect, this is a rather bleak, depressing but totally fascinating flick that boasts some powerful performances, particularly from Lawrence and John Hawkes as her meth-addicted uncle “Teardrop.” Winter’s Bone captured the Grand Jury Prize for Dramatic Film at the 2010 Sundance Film Festival and received four Academy Award nominations for Best Picture, Best Actress, Best Supporting Actor and Best Adapted Screenplay. Film was based on a 2006 novel of the same name by Daniel Woodrell. Useless Trivia: Hawkes portrayed "Bugsy," one of the ill-fated crew members of the Andrea Gail in The Perfect Storm (2000).